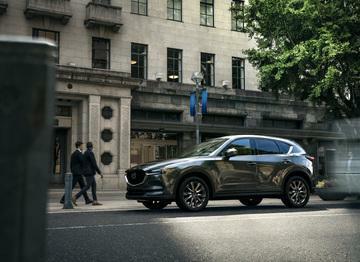 There’s quite a bit to love about Mazda’s crossover lineup. And with so many great options, the real challenge involves finding which is right for you. After all, the Mazda CX-3 and Mazda CX-5 offer plenty to any driver. So it really comes down to the features inside. Let’s take a closer look at what both these crossovers have to offer. Let’s kick things off by checking out what’s under the hood. 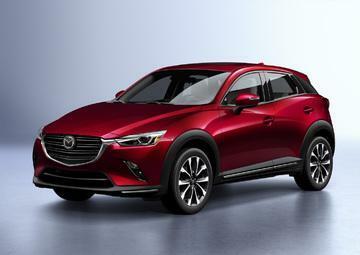 Overall, the 2019 Mazda CX-3 offers a 2.0L Inline 4 motor. You can expect 148 hp and 146 lb-ft torque. Thus, it’s more than capable of passing any Sunday drivers. And with AWD capability, no terrain or weather is off limits here. Plus, you’ll even get a 6-speed shiftable automatic transmission. In other words, you decide how you drive your 2019 Mazda CX-3. What’s also impressive is the fuel economy. With 27 city/ 32 highway mpg, this crossover ranks well above its competition. And it goes without saying that you’ll save plenty at the pump with the Mazda CX-3. Once you step inside the Mazda CX-3, you’ll find plenty of fun and convenient features waiting for you. For starters, the standard keyless ignition ensures you’re ready to go the instant you enter your car—no need to dig for your keys in your pocket. Also, the standard cruise control ensures you’re ready for any long highway drive. And if you’re looking for an upgrade, you can even opt for adaptive cruise control. With this feature, even rush-hour traffic can feel enjoyable. Speaking of optional features, navigation is available across all trims. So find a few new routes on your commute if not find a new adventure altogether. Don’t let its size fool you. Inside, the Mazda CX-3 offers quite the spacious cabin. For starters, your rear seat passengers will receive 35 inches of legroom. That’s more than enough for passengers over 6’ tall. What’s more, your backseat riders will also receive 50.4 inches of shoulder room. Thus, no one ever feels too close for comfort. As far as cargo goes, you’ll get 12.4 cubic feet of space. That’s enough for backpacks, gym bags, a couple sets of golf clubs, or even your weekly groceries. Pop the hood on the 2019 Mazda CX-5 and you’ll find a 2.5 inline 4-cylinder engine. You’ll even receive more power here as well with 187 hp and 186 lb-ft torque. And much like the Mazda CX-3, you’re still getting that AWD drivetrain with a 6-speed shiftable automatic gearbox. Therefore, there’s plenty of fun waiting for you with this engine. 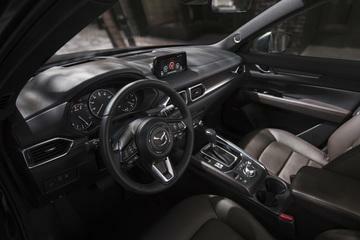 Enter the Mazda CX-5 and gain access to the keyless ignition. Plus, navigation is an option on some trims. So, no more worrying about your phone’s battery or reception. Also, cruise control comes standard. And for even easier drives, don’t forget to opt for the driver assist features, like adaptive cruise control and parking assist for those tricking parallel parking spots. As far as comfort goes, heated and cooled seats are available on certain trims. Thus, your Mazda CX-5 will keep you comfortable in any season. As a result of its larger frame, your passengers will fit comfortably in the rear seats. In fact, with 39.6 inches of leg room and 54.8 inches of shoulder room, all passengers can fit without rubbing elbows. It’s the type of space you’d expect from a full-sized SUV. Also, don’t forget about the 30.9 cubic feet of cargo space. That’s more than enough room to pack for an entire vacation and fit plenty of grocery and sport bags in the process. Want to test these crossovers out in person? Then stop by Yarmouth Mazda for a test drive. And while you’re at it, feel free to browse our new inventory. You’re sure to find the best SUV for you.